Something I haven’t written much about yet is the unbundling or unravelling of modes. This is a way of separating cycle routes from main routes for motorised traffic. In the Netherlands it had been common practice to separate people cycling from motorised traffic on road level on all main roads from as early as the 1930s. In more recent years there has been a shift to separating these types of traffic even more: on route level. A lot of roads for motorised traffic have been diverted to go around residential areas especially in the last 10 to 20 years in the Netherlands. Municipalities used the opportunity these diversions gave them, to downgrade the original roads so they became fast routes for cyclists. The old routes are usually more direct than the new diversions and those streets are also safer from a social point of view, because they go past or through residential areas where there are usually a lot of people. 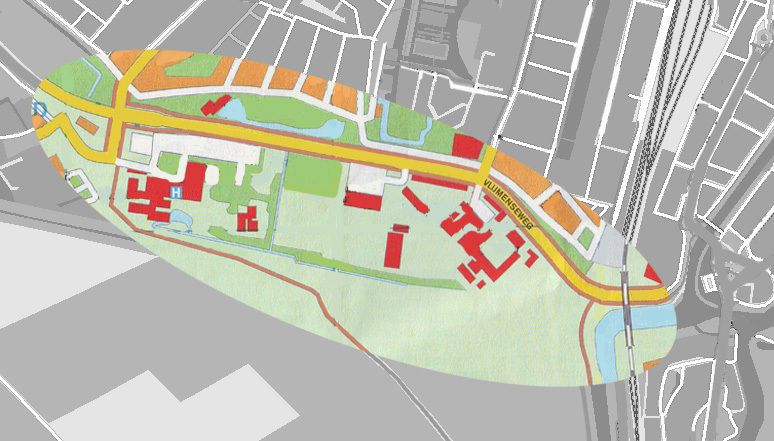 I can show you an example of the unbundling of a cycle route in the South of ’s-Hertogenbosch that was (almost) completed recently. Vlijmenseweg is a road that formed the South ring road around the city. It was constructed in the 1930s and was interestingly enough at the time also a diversion from the earlier straight route that had become a residential street (see the green line on the 2012 map below). Right from the start, this main highway was built with separated cycle tracks. The concrete surface has served the entire lifetime of the road which was from 1936 to 2012, so it lasted for 76 years! Map showing the situation around 2000 projected on today’s map. A main road with cycle tracks (in red) directly next to it. The old fashioned way of building main routes. That means that at every junction the different types of traffic cross eachother’s path. The canal in the bottom right does not align with the present situation because it was moved sideways to make room for the new South circular road in between the railway line and that canal. The map from around 2000 shows the old situation. 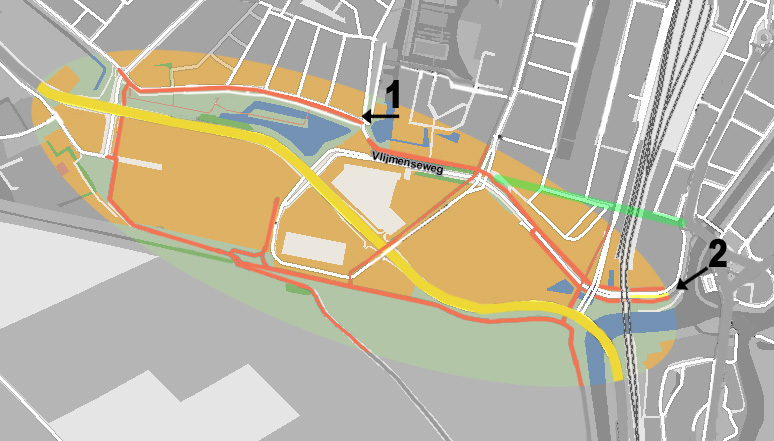 The thick yellow line running from West to East is Vlijmenseweg. A two lane road that became four lanes once it left the city. There were separated cycle tracks, 2 meters (6.5Ft) wide in each direction, directly next to it. This map shows the 2012 situation. The cycle route and the route for motorised traffic have been unbundled completely. For cyclists there are now two East-West routes, one North and one South (the red lines). All the crossings are now multilevel which makes the crossings very safe. Notice how the pond was extended to the South: where the road used to go straight on there is now water, making the new cross roads more logical too. There are a lot more buildings in the area now, the new city hospital being the largest of those buildings. The green line represents the original Vlijmenseweg before the 1936 diversion. On the 2012 map we see that the situation has completely changed. Motorised traffic that used Vlijmenseweg was diverted from about the centre of the picture to run even more South. The old 2 lane road is now white, meaning it is not an important through route anymore. There the cycle paths remained right next to it. From where the road was 4 lanes, a new route, the actual diversion, was constructed. The new part is also 4 lanes wide but comes without any cycle provisions. That is because the new cycle route is a two way cycle path that runs to the North, on the edge of a residential area, sometimes several hundred metres away. Because the routes are now unbundled it means there are far less crossings. Where both routes do cross tunnels were built, so the crossings are now much safer than in the old situation. In addition to the North route an extra cycle route to the South of the new road for motorised traffic was built. So people cycling now have two options to cycle from East to West and vice versa. The North route has more social safety because it runs closer to a residential area with more people. But if you want to ride very fast the South route through the fields is perhaps the better option. The picture below shows the North route facing West. The arrow with 1 on the 2012 maps shows the location where the picture was taken and the direction in which we look. On the right hand side the homes and on the left hand side a pond. Behind the pond and in front of the new city hospital the route for motorised vehicles is barely visible. 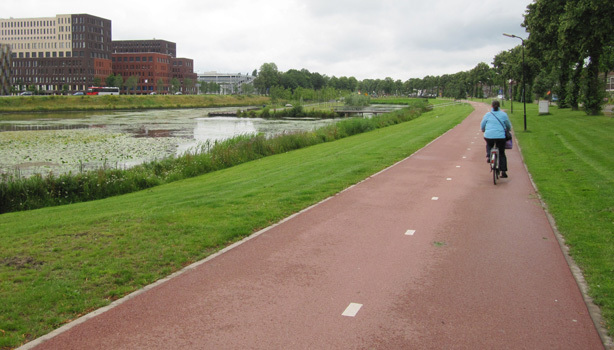 The new cycle route is separated from the main route for motorised traffic that can be seen to the far left behind the pond and in front of the new city’s hospital. Behind the trees to the right is a residential area facing the cycle route. This enhances the feeling of social safety. 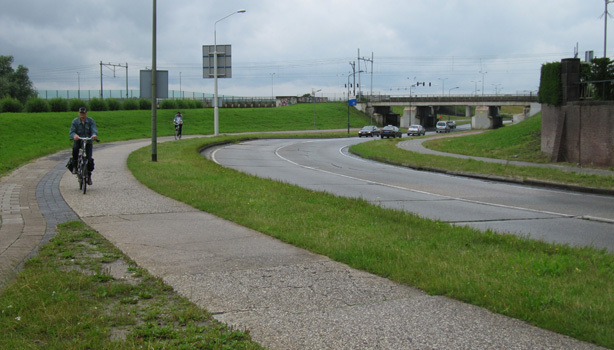 The part of Vlijmenseweg that has now lost it’s function of main road has remained the way it was. A two lane road for motorised traffic with cycle paths directly next to it. Well perhaps not directly as there is at least one meter separation with a grass strip. The cycle path is 2 meters wide. In the mid-1930s England was also experimenting with cycle tracks like that. But somehow the British lost their interest and the Dutch did not. This road seems not to have changed since it’s construction in 1936, but that is not entirely true. The main flow of traffic has been diverted to a new 2×2 lane highway South of this location. Recently the surface was modernised. The old concrete was replaced with smooth asphalt (this was done after the picture was taken). Both pictures were taken from the location marked with a 2 on the 2012 map in the direction of the arrow. 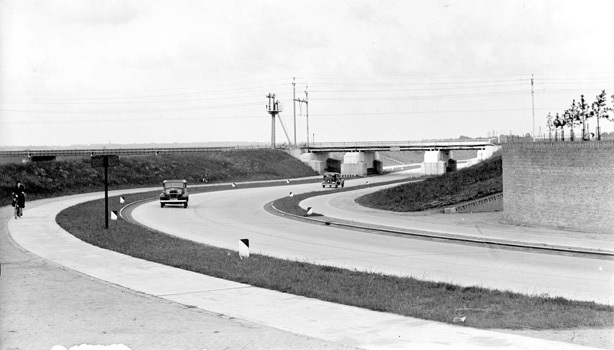 Vlijmenseweg just after it’s opening in 1936. The old route had a level rail road crossing, this route had a grade separated rail road crossing; extremely modern for 1936. The cycle paths were an integral part of the new road, designed in from the start. Vlijmenseweg in July 2012. Little seems to have changed since 1936 but that is not entirely true. The main flow of traffic has been diverted to a new 2×2 lane highway South of this location. In October 2012 the road and the cycle tracks were resurfaced and the 76 year old concrete was replaced by black and red smooth asphalt respectively. Video showing the reconstruction of part of the route. From a service street to a two way cycle path. Video showing the entire North route of the unbundled cycle route. This is a continuation of the route shown in this earlier post. Two students of Boston University cycled the South route which can be seen in their video. Motorised traffic can be diverted well around areas that cyclists can simply cross, because distance is not such a problem for motorised traffic. As long as the travel time stays under a certain limit and as long as the new routes have a good flow, people in cars are willing to travel (much) longer distances to get from A to B. The fact that the diverted routes for motorised traffic are longer gives cyclists the advantage of the shorter route, which makes cycling more attractive than using a car. When motorised traffic is diverted around an area, that area becomes more pleasant and liveable and the available space can be used for people, often even without the need for separated cycle infrastructure. 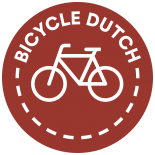 The traffic calmed areas can for instance be changed to 30km/h (18mph) zones in which cyclists and the remaining lower amount of motorised traffic can easily mix. Where road managers do make a choice for separated cycle paths, these paths are well away from noise and air pollution of motorised traffic. This makes cycling even more pleasant than on a cycle path directly next to a main route. Because traffic is unbundled there are fewer places where the different types of traffic have to interact. That makes it possible to make the fewer crossings multilevel within reasonable costs. This also reduces the number of traffic lights and thus the number of stops. That makes travel times shorter and to be able to cycle un-interrupted at a constant speed is very pleasant for cyclists. Unbundled cycle routes can be made bi-directional in a more safe way (because of the fewer crossings). A bi-directional cycle path is wider than a cycle path for one direction, which makes it easier for faster cyclists to pass slower cyclists. Unbundled cycle routes usually go through residential areas giving cyclists a better sense of social safety than they would have on cycle tracks on larger roads which are kept well away from homes and people. Here in the UK we really need to look at cycling infrastructure and in particular the Dutch model. There are so many fatalities on the UK roads as there is the “Them and Us” attitude over here. We need to learn to share the road. The UK Government are trying to get us to ditch the cars and commute to work and on shorter journey by bike as it’s healthier and keeps pollution levels down. They NEED to make the roads safer to help encourage this to happen. Fingers crossed in the next few years we can move forward and build a proper cycling infrastructure in the UK and get more people out the cars and onto bikes. You mean share the road on quiet 20 mph zones in urban areas and quiet 40 mph zones in rural and exurban areas. Good point Guy, when we see old films here in the UK of workers streaming out of Northern factories when the whistle goes at the end of the day (I’m thinking Albert Finney type films if anyone’s interested) then mass cycle use is definitely prevalent. There are certain things we can definitely learn from the more austere past. A most interesting post. Thank you very much! Lovely post. The ideas are exemplary and should be implemented in most of the “civilized” world. I sit here in Warsaw sort of straddling two worlds. European, my current home and the US, my homeland by birth. It saddens me to see even countries like Poand passing the US in many regards of cycling infrastructure. Certainly the Poles are no where near the pragmatic efficiency that is applied in the NL, but still looking back at the US while reading your list of points regarding separation and I can’t help but think that the whole of Europe will always be far ahead of America. In the US ‘we’ are unwilling to embrace the points above simply because they ‘might’ result in some minor inconvenience to motorists, whether real or perceived. This is true of not only roadway planners, but so-called cycling advocates as well. Reading this post, I came to think about industrial areas in the Netherlands and elsewhere. I noticed that these are very hostile to cyclists in a lot of countries, with heavy traffic, no provisions for pedestrians or cyclists, lots of wide driveways with large turning radiuses etc etc. I’s a bit different in NL; perhaps you could show this in a future post? This comment reminded me of my 18 years spent on an archetypical modern industrial estate in Emmen, from 1960 till 1978, which had heavy traffic and no pavements or cyclepaths, not even white lines. Looking the same estate up on Google Maps (“albatrosstraat emmen nederland”) reveals that in the 30 years since this street has got pavements/sidewalks, cycle lanes and white lines. This in a relatively poor region with high unemployment. Something that’s important for city planners to be aware of is that the employees in industrial areas tend to have a low income. Expecting them to drive to work will sometimes result in hardship as they are forced to keep a car operating. Providing them with a way to cycle to work will mean they can live better on their incomes. I think cycle paths go very well in industrial areas. This entry was posted on 29 November 2012 by Bicycle Dutch in Original posts and tagged ’s-Hertogenbosch (Den Bosch), before and after, filtered permeability, history, infrastructure, unbundling.